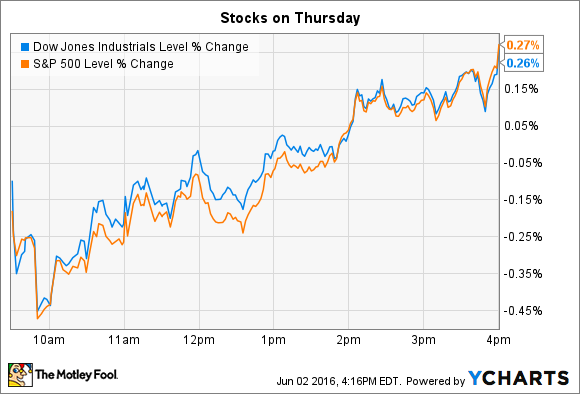 Here's why these two stocks made huge moves on Thursday. In economic news, the pace of hiring slowed last month, according to the latest ADP employment report: 156,000 jobs were created in April, compared to 194,000 in March. Investors will get a more comprehensive reading of the job market on Friday, when the government releases its official monthly employment report. Economists are looking for payroll gains of 165,000 as the unemployment rate ticks down to 4.9%. In the meantime, stocks making notable moves on Thursday included Ciena (NYSE:CIEN) and Box (NYSE:BOX), which both posted quarterly results before the opening bell. Ciena's 13% pop pushed it above $20 per share for the first time since early March after the packet and optical networking specialist beat consensus estimates for its fiscal second quarter. Sales rose 3% to $641 million, which was near the high end of management's guidance. Gross margin was also solid at 44% of sales. Meanwhile, a smaller than expected boost in operating expenses helped Ciena produce adjusted earnings of $0.34 per share and outpace Wall Street's $0.27 per share target. "This quarter's strong financial performance is a result of the investments we've made to diversify our business, in particular the expansion of our packet business and our momentum in key geographies," CEO Gary Smith said in a press release. Ciena executives believe they are in a good position to capitalize on the move toward on-demand networking, which should deliver higher growth and profitability over the long term. To that end, Smith and his team projected continued steady growth for the next quarter. While its sales forecast is wide at $655 million to $685 million, the midpoint of that guidance, $670 million, is ahead of consensus estimates. Adjusted gross margin is also forecast to continue improving to roughly 45% of sales in fiscal Q3. Box, which offers cloud-based content management services, fell 11% following solid quarterly earnings results. Sales soared 37% and edged consensus estimates as the company added 5,000 new clients to its rolls (including AirBnB and Brooks Brothers). Box is still far from generating a profit on those surging sales, although net losses improved from $47 million to $39 million. The company's billings growth hit a wall, falling to just 9% from over 50% in the prior quarter. Normally, a change like that would suggest that a major revenue growth slowdown is in the cards. However, in this case, the decline has more to do with seasonality fluctuations in Box's business: Executives still expect to boost revenue by 30% next quarter. Looking further ahead, it isn't likely Box will see a net profit for this fiscal year, but management does believe it will achieve the key financial milestone of positive cash flow by Q4. It nearly hit that mark this quarter, as operating cash improved from a $32 million outflow to a $4 million outflow, year over year. Still, investors chose to take a cautious reading on Box's slowing billings growth and sent the stock lower on Thursday. Given the company's short public history and ongoing losses, it's understandable that some shareholders would balk at any suggestion that demand could be weakening.